While many people collect postcards for the picture or stamp that adorns them, the genealogist and historian alike can find a wealth of information in the humble words written on the back. Take this example currently for sale on an auction site. Look for the clues in the sender's name, who the card is addressed to, and any mentions they make of the town. The obvious is first to start with the photo. This is the newly opened Thames Hospital on Baillie Street - so the card you would expect to be used early 1900s. Next the postmark - could be 09 (1909) and the PENNY UNIVERSAL stamp was issued 1901 and 1908. 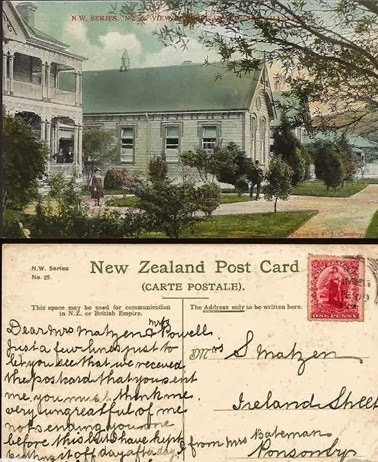 This card was sent by Mrs BATEMAN of Thames to Mrs S MATZER (AKA MATZEN) of Ireland Street, Ponsonby. In the 1911 Electoral Roll, Mrs Susannah MATZER/MATZEN is still living at 30 Ireland Street in Ponsonby and is recorded as a widow. In the early 1900s the Bateman family is well known as Butchers, just one block from the hospital. The 1905 Electoral roll shows three women who could have been the letter writer. Susannah Matzen died in Auckland in 1927 and is buried at Purewa Cemetery, Auckland. Back in 1867, Susanna Powell had married mariner Captain Peter Matzen. Peter Matzen died in 1898. If you have treasures like this postcard, consider contributing a digital image of the card to The Treasury - so we can continue to look at our past families of the Thames. Back in the 1960s it wasn't unusual to turn the tap on and find some tadpoles in the bath water. Maybe it had been raining and you needed to leave the taps on to try and clear the silt and debris. Over the years Thames had many ingenious ways to get a water supply to the town. These included very complex water races around the town. 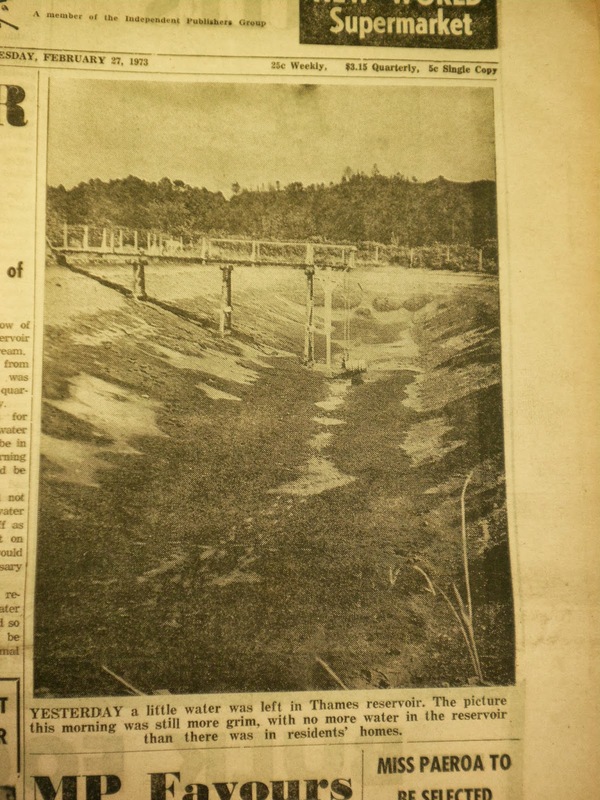 The Kauaeranga River providing a large amount of water for the township. The photo below is taken February 1973, of the Reservoir which was located at the north end of Hill Street Thames. A large, open, concrete 'bowl' that held a water reserve for the Thames township. Things were grim when this photo was taken - the reservoir literally empty! 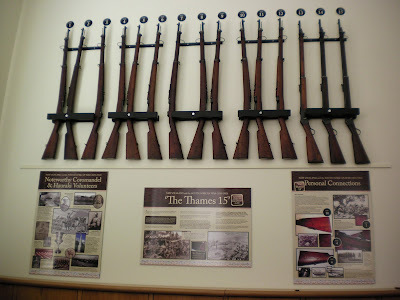 With the South African War in the news regarding the Trophy Rifles returning to The Treasury at Thames, it was opportune to see this photo tonight at Auckland Libraries. Below: Step back to February 2013, when the building was just a dream! Why did three Spingboks players come to Thames last week? Springbok players – brothers Jannie and Bismarck Du Plessis - and Ruan Pienaar spent most of Thursday in Thames on an unofficial visit that included Thames High School, The Treasury, Thames-Coromandel District Council and the Thames Rugby Club. The visit was facilitated via Johan Volsteedt, the former Head Master of all three men and a man who devoted his life to their own high school, Grey College in South Africa. The players visited not as Springboks but as Old Grey College Boys whose ancestors were affected by the Boer War. The visit gave them a rare opportunity to see with their own eyes Boer rifles that bear their surnames and are now housed at The Treasury in Thames. 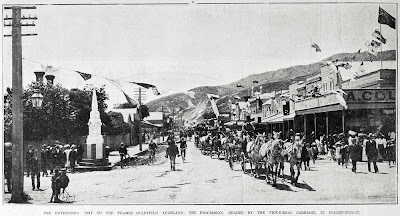 It was a surprise to many to learn about the influence that Sir George Grey had in South Africa, he was of course a famous and much respected visitor/resident/MP of Thames in the goldfield days. It is reputed by many that he planted the Oak trees by Thames South School and resided in Grey Street. 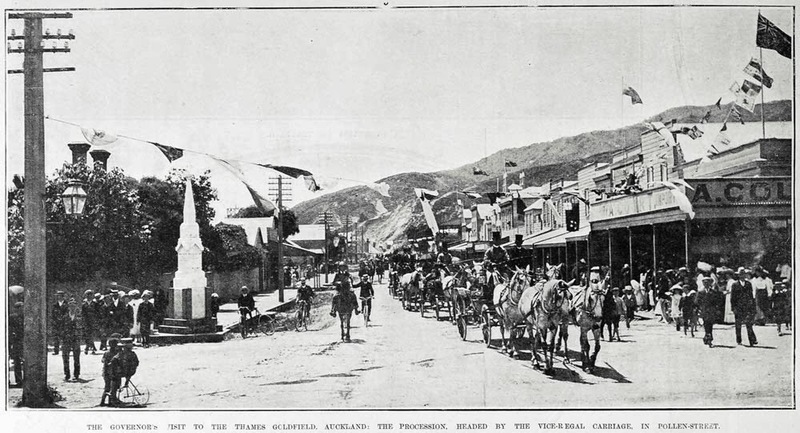 Full research material is available at the building for all level of researcher - due largely to the work of Mike Dwight, who wrote: WALTER CALLAWAY: A MAORI WARRIOR OF THE BOER WAR. This book is available for sale at The Treasury shop. The Sprinbok visit featured on the television programme 'Seven Sharp' and can be viewed from the television archives. Tuesday is always a busy day at The Treasury building in Thames. The Indexing group meet to index the resources available at The Treasury, and this information is then available in The Treasury index. The Index aims to make researching easier and more effective, the plus being that you can check it out online from your home. 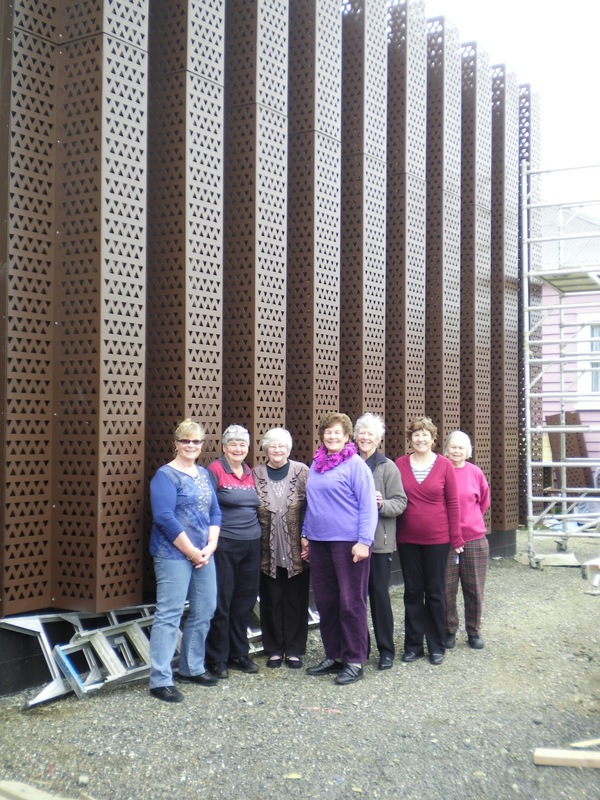 Today when I dropped in the rooms were empty - the indexers were found outside inspecting the cladding that is going on the walls. Hard to do justice to explaining how great and effective the building is looking. Without saying anymore...a sneak preview is below. 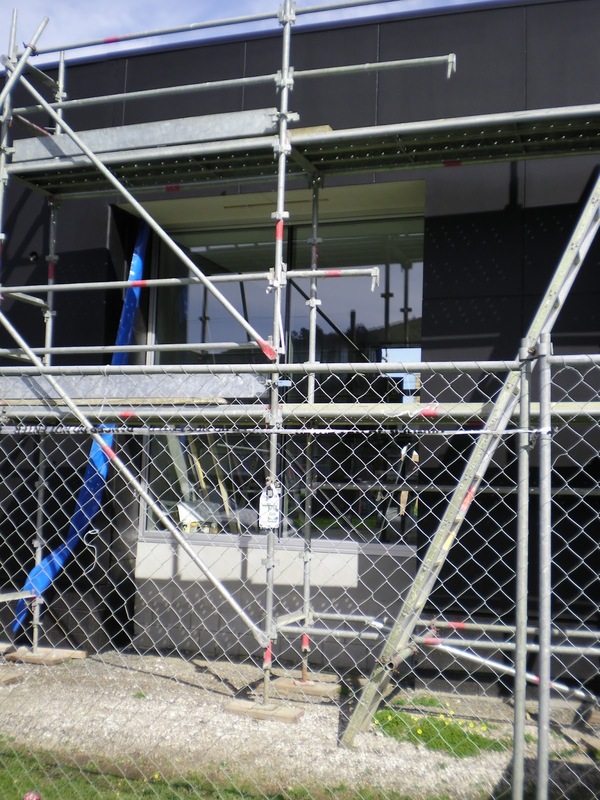 Watch this space for more, as the whole building is transformed...from chrysalis to monarch butterfly phase is underway. NURSES OF THAMES, sorry to report I found an error today. Page 34 regarding WWI Nurses - in error the wrong award was quoted for Cora ANDERSON and Lily EDDY. They did not receive the Serbia Cross. They both received the commendation where their services were brought to the attention of the SECRETARY OF STATE FOR WAR. Today outside the archives building, signs of activity could be seen through the wonderful large glass window - this is in the work area, with the archive storage to the south and miscellaneous rooms to the north. 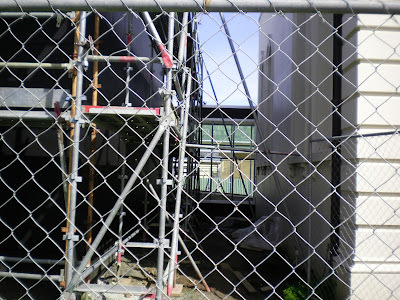 Also looking west from the footpath, the interconnecting glass-walled walkway can be seen. 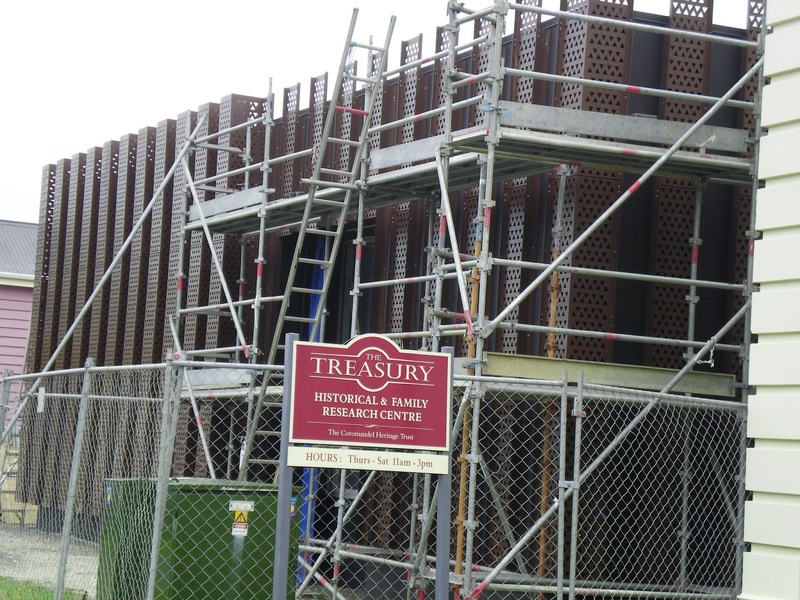 This connects the New Archive building with The Treasury Library (Old Carnegie/Public Library). The NZSG has an updated CD that helps with researching World War One service personnel. 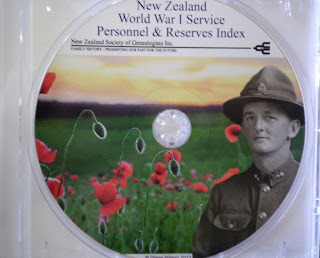 "New Zealand World War I Service Personnel & Reserves Index"
This along with other World War One resources are available for researchers at The Treasury in Thames. Died 4 Oct 1917 Ypres, Belgium. NOK: Son of Hugh and Ellie Poland, Paeroa, Thames. Poland is on the Thames High School War Memorial Memorial and Plaque and also the Thames Peace Memorial. Photos of these are available at The Treasury website: THAMES WAR MEMORIAL FOR WORLD WAR I (1914 - 1918). It will be learnt with regret that one of those who has just been killed in action is Mr Hugh Poland, son of the member for Ohinemuri. Very great sympathy will be felt for Mr Poland and his family in their sad loss. While hunting the papers for some WWI death notices, there was an interesting report on the demolition of old Thames buildings. 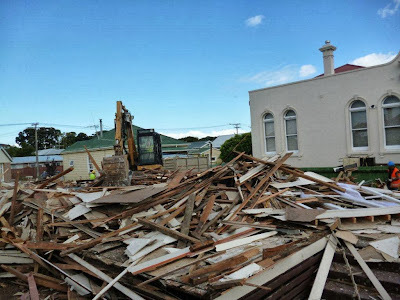 Never ceases to amaze me how we used to have so many two storied buildings! This looks like a grand old residence. Does anyone recognise it? The location and who owned/lived in it? If you have any photos of Thames buildings that have been demolished, please contact me and I will feature them on future blogs. "Another of the older buildings in Pollen Street, Thames disappears. 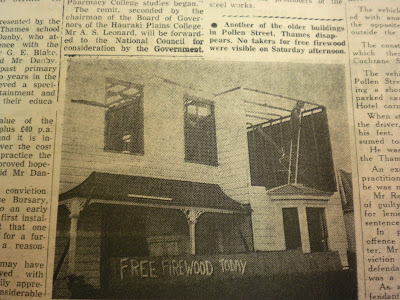 No takers for free firewood were visible on Saturday afternoon." Remember the days when the red telephone box was vital? For many people the telephone was a luxury and the local box was the only method of communication - a far cry from the land of mobile phones that appears to exist today. It stated that "Many people when using a public telephone actually press their lips into the mouthpiece." August 1970 Thames got a grand new phone box outside the Chief Post Office at Thames. Present day Thames from the Pedestrian crossing outside the old Chief Post Office, Pollen Street. 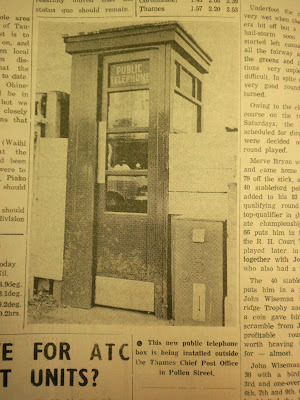 A telephone box is still in the locality of the 1970 box. Visiting the Shortland Wharf today and the southern side has a large historic landmark sign. A wonderful addition - keep the eyes open for more about the town. 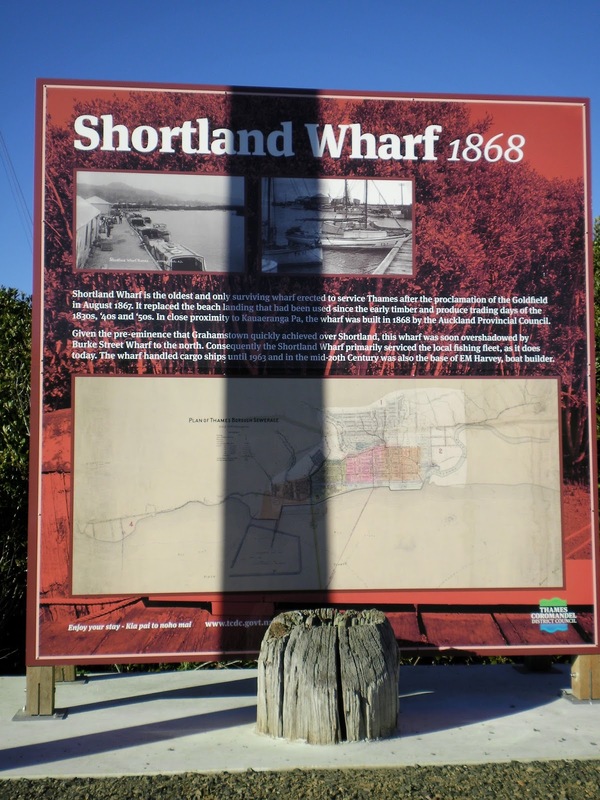 Shortland Wharf is the oldest and only surviving wharf erected to service Thames after the proclamation of the Goldfield in August 1867. It replaced the beach landing that had been used since the early timber and produce trading days of the 1830s, ‘40s and ‘50s. In close proximity to Kauaeranga Pa, the wharf was built in 1868 by the Auckland Provincial Council. Given the pre-eminence that Grahamstown quickly achieved over Shortland, this wharf was soon overshadowed by Burke Street Wharf to the north. Consequently the Shortland Wharf primarily serviced the local fishing fleet, as it does today. The wharf handled cargo ships until 1963 and in the mid-20th Century was also the base of E M Harvey, boat builder.